If you want to watch the Rose Parade in person, you don't have to sit on Colorado Boulevard all night with the folks throwing marshmallows and spraying Silly String. You don't have to spend lots of money on bleacher seats and parking, either — even though other resources make it sound like this is a must. A little preparation and some insider tips are all you need to see the parade for free, with the least possible hassle and expense. If You’re Reading This on New Year’s Day skip down the page to the next section. You need to get started before it's too late. 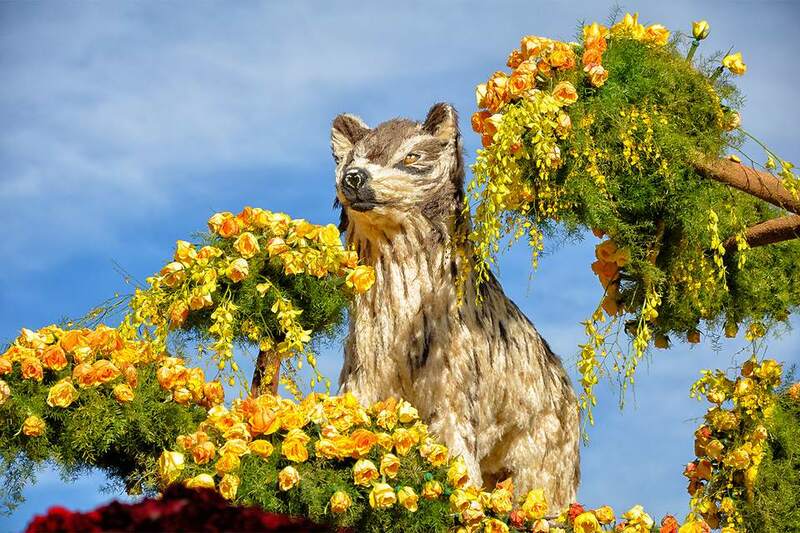 If you can have a little more time, you'll find even more information, tips, and insider ideas in the complete Rose Parade guide. If you want to see the Rose Bowl football game, get to this page early before the tickets are all gone. The Rose Parade route is 5.5 miles long. It starts at Green Street and Orange Grove Boulevard at 8:00 a.m. It will reach the last section of the route a little over 2 hours after it started. You may have heard about the crowd of people who camp out overnight on the street to see the parade - or seen the grandstand seating on television. Both of those areas are near the parade’s starting point at Orange Grove and Colorado Blvd. Crowds thin out as you go further down the route. Parade veterans recommend watching from the street near Pasadena City College, between S. Hill Avenue and S. Allen Avenue on Colorado Boulevard. If you start there and it's crowded, walk east until you find a spot. The location in the directions below is a good compromise. You could watch the parade anywhere further along the route, but don't go too far. The floats don't get tired, but the marching bands and dancers do. In fact, they often stop performing and just walk the rest of the way. The parade route turns north at Sierra Madre Boulevard and continues north of I-210, but tall floats have to bend or retract so they can fit under the freeway overpass. When they do that, they also turn off their animation and are less fun to see. Unless you got up very early this morning, you might have missed your chance to see the parade in person. That is unless January 1 is a Sunday. Out of respect for local churches along the parade route, the Rose Parade is held on January 2 when the first falls on Sunday. The parade starts at 8:00 a.m. Sharp. Don't worry that you have to be on the street that early, though. If you can get to Union Station in downtown LA by 8:30, you can see most if not all of the parade using the directions below. If you’re motivated and want to try a last-minute dash to see it, here’s what to do. Visitors often complain about how dirty the porta-potties get along the parade route. It's probably best to "go" before you go. Grab your sunscreen and a hat. The viewing location you're going to faces into the sun. If you have a selfie stick for your phone camera, grab it, too. Not to take pictures of yourself, but to get your phone high enough to capture the floats and not the backs of other people's heads. Grab some cash. It will speed you through the Metro ticket-buying process. Don’t try to drive into Pasadena. Instead, use public transportation. If you can't get public transit to work for the entire trip, drive to Union Station downtown, where you can park and catch the Metro. Use the app ParkMe - or the ParkMe website - to find a parking lot with good rates and available spaces. Use the Metro Gold Line train from Union Station to Pasadena to get to the parade route. You can take other lines from your starting point and transfer to the Gold Line in downtown LA. Be sure you have enough time to try this. If you can't get to Union Station by 8:30 you'll miss part of the parade. If you will get there after 9:30, grab another cup of coffee, turn on the television and watch instead. Experienced parade-watchers also say to take public transportation to get there, and it's an excellent idea. You’ll avoid traffic hassles, closed streets, and freeway exits - and paying $20 or more to park once you get to Pasadena. On parade day, LA Metro Gold Line trains run to Pasadena from Union Station downtown about every 7 to 8 minutes, starting about 5:00 a.m. To plan your entire trip, use Allen Station in the Metro trip planner. Enter your current address as a starting point. Get to Union Station by 8:30 a.m. which will get you the parade route by 9:00 a.m. The Gold Line entrance is about halfway down the tunnel in Union Station. If you already have an LA Metro card, use it. If not, don't waste time scratching your head over how to use the ticket machines. Instead, look for people sitting at a table nearby. They sell pre-loaded cards that will get you to the parade and back. Exit at the Allen station. Lots of people will get off at Memorial Park, and people on the train will be saying that's the best stop. Don't listen to them. Testing has proven that it's best to keep going. After you get off the train, walk south for about 10 minutes (about a mile) toward Colorado Boulevard. In case you're directionally challenged, that means you should be walking away from the mountains, not toward them. You could go straight ahead to Colorado, but this little detour will get you closer to the action: Turn left on Walnut, then right on Parkwood to Colorado. If you want to drive instead, approach Pasadena from the east on I-210 and try to find street parking in the area just south of I-210 and Sierra Madre Boulevard. Walk over to Sierra Madre and hope you’ve made it in time to catch the parade at its end. If you don't get there on time, post parade viewing is on Sierra Madre just north of 210, where you can see the floats up close for a reasonable admission fee (less than the cost of an evening movie ticket).